– Only 27g, ultra light to wear and portable. – IP45 water resistance, you can wear it on raining day, lighting road for you. – 500mAh battery for long lighting time, once charging for long companionship. – Three types lighting angle for different needs. – One-button operation, anti-slip silicone button, easy to use. 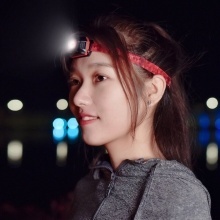 – High elasticity designed on the headband, comfortable wearing feeling, adjust the suitable size according to your head size. – High light, flash light, SOS, three light modes, for lighting and warning use.